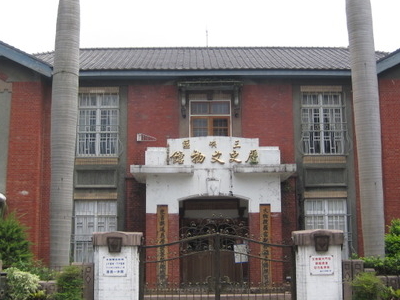 The Sanxia History Museum (Chinese: 三峽歷史文物館; pinyin: Sānxiá Lìshǐ Wénwùguǎn) is a museum of local history in Sanxia District, New Taipei City, Taiwan. The museum was built at the former local seat during the Japanese rule. The reconstruction process to make the museum from the former building started in 1999 for 4 years. The museum is a two-story building. The first floor has an exhibition area that periodically hosts art activities. The second floor has an exhibition area of Sanxia historical items, old time implements and memorabilia. The museum is accessible southeast from Yingge Station of the Taiwan Railway Administration.